Star Wars Celebration 2019 is about to bring the house down. That's because there's the small matter of a mahoosive Star Wars 9 reveal on the way from the Force-tastic event in Chicago. So, you need to get prepared: We're going to walk you through how to watch Star Wars Celebration 2019. Want a (virtual) front-row seat for all of the big events across the weekend, from that J.J. Abrams panel to Respawn pulling back the curtain on its latest game with the Star Wars Jedi: Fallen Order panel? You'll need to punch it and scroll down below to check out the list of Star Wars Celebration streams. Otherwise you won't be able to see the very first potential Star Wars 9 trailer as it launches, nor will you freak out over the Star Wars 9 title alongside everyone else. Basically, if you don't know how to watch Star Wars Celebration 2019, you're going to miss out on that and SO MUCH MORE in a galaxy far, far away. But even masters of the Force might struggle to figure out how to watch Star Wars Celebration 2019 in the US and UK, what with all of the different time zones and now Daylight Savings to be aware of. But, don't worry: we've got you covered on that front, too. After all, this is the Star Wars event you’re looking for – and one you absolutely don’t want to miss out on. Star Wars Celebration 2019 runs from Thursday, April 11 and lasts all the way until Monday, April 15. That means there’s a whole lot to pack into a short space of time. Your main source of Star Wars Celebration 2019 streams and up-to-the-minute news is undoubtedly going to be the Star Wars Show Live stream, which will be available on both StarWars.com and the Star Wars YouTube channel. 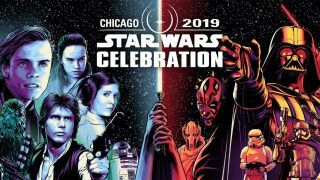 Make sure to check out the Celebration Stage schedule, too, for all the big happenings when it comes to all things Star Wars. Elsewhere, there’s also a Star Wars Celebration mobile app for IOS and Android. Keep refreshing that for the latest and greatest news from the convention floor and the flurry of panels going on throughout the week. Of course, this is the big one. The Star Wars 9 panel is on Friday, April 12 on the Celebration Stage at 11am Central. That’s 8am Pacific and 12pm Eastern for those of you dotted across the US. To watch the Star Wars 9 panel in the UK, you’re going to need to tune in to one of the pages linked to above at 5pm BST. If you’re not around at those times (or can’t stream at work or school), then be sure to keep tabs on the Star Wars Celebration Twitter account and, of course the official Star Wars Twitter account. Any new trailers or title reveals will be there just seconds after it goes live. But that’s not all you hear from GamesRadar+ when it comes to Star Wars Celebration 2019. Throughout the week - and rolling on to the weekend - we’ll be covering all the news as it drops, including all the galaxy of shocks and surprises that Star Wars might throw our way across the five (!) glorious days. It might be time to start swotting up on all the new Star Wars movies coming your way over the next few years.